Okay I have to ask......What's the deal with the owl obsession? Everyone is not cuckoo over cocoa puffs, they're cuckoo over OWLS. When my daughter signed me up to bring desserts for a class party owls were NOT on my mind. I wanted to make cute Halloween cookies. However, Miss B had other plans. She wanted owls.....cute girlie owls. 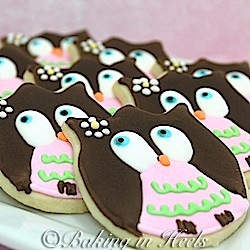 I remembered seeing some owl cookies by one of my favorite cookie makers, Sweet Sugarbelle. She is always so inspiring. 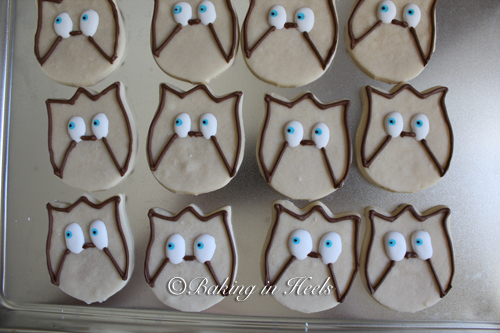 So.....off to the kitchen I went to make owl cookies, because what Miss B wants, Miss B usually gets. No, I have not jumped on the owl bandwagon.....sorry I just haven't....not YET anyway. I just didn't see the "cuteness" that everyone else saw.....UNTIL I made these. I NEVER admit when I am wrong. 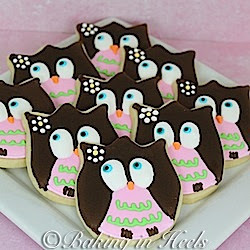 So I'm not going to say I was wrong and owls are cute, just that I make cute cookies....will that work? Yeah, we'll go with that. 1. First make eyes on cookie. Let dry. Then outline the brown parts of the owl. Let dry 30 min. 2. Fill in brown area of owl with flood icing. Let dry 3-4 hours. If you have bleeding issues with your icing, let it dry a bit longer. Here's where it gets tricky....because your blogger (me) forgot to take pictures. So you will have to rely on your imagination. 3. Next outline pink area of owl. Let dry 30 min then fill with pink flood icing. 4. add flower bow to owl and orange beak. 5. pipe green scallop design on owl's belly for feathers. 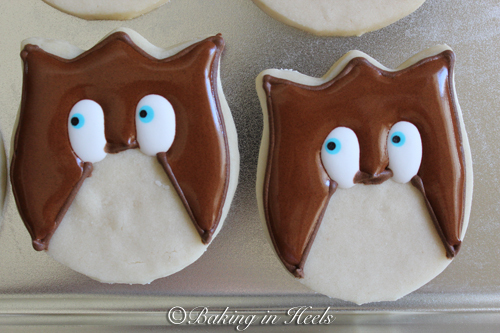 For other cute owl cookies, check out Sweet Sugarbelle's blog. Love the Owl cookies! They are so cute! @Cristin (Pinkie) I know, I didn't like them until the cookies....now I think they are cute. They certainly were a hit at the high school. haha i am crazy 'bout owls! love your website me and my kids read abouts it all OF THE TIME! thank you! i have heard the rumors and the rumors are true! owls are the real up and comers. i think i will have an owl cake! thanks for the recipes!!! !